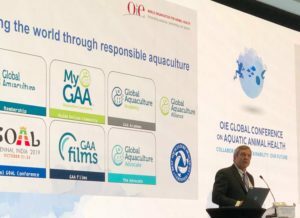 Global Aquaculture Alliance President George Chamberlain was a keynote speaker at the World Organization for Animal Health’s Global Conference on Aquatic Animal Health in Santiago, Chile, from April 2 to 4. Featuring more than 30 speakers, the conference highlighted the critical contribution of aquatic animal health programs to improving aquaculture productivity and sustainability. It also raised awareness of the need for good governance of veterinary services and aquatic animal health services. Titled “The Global Seafood Revolution,” Chamberlain’s 30-minute keynote presentation on Day 1 of the conference offered a 30,000-foot view of the global seafood landscape, highlighting aquaculture’s role in meeting the globe’s appetite for seafood. Chamberlain then went on to discuss the challenges facing aquaculture, with disease being the No. 1 challenge. The others are the environment, feed (i.e. reliance on marine ingredients), financing and market acceptance. “We need control, efficiency and trust. Under control, it comes down to disease risk and environmental impact. And then for efficiency, we have to learn to produce more and more with less and less. It seems like a paradox. But we have to learn to produce with less land, less feed, less energy, less labor and so on. And, for trust, do we have the social license to operate? There are areas in the world where aquaculture is not welcomed,” said Chamberlain. Presentations from Global Conference on Aquatic Animal Health are available on YouTube at https://youtu.be/Cq9OSPCY3dc.